Michaels had these wonderful vinyl owls to paint last time I went there. Unfortunately, they only had 2 at my local Michaels, so I bought one each for TG and William. 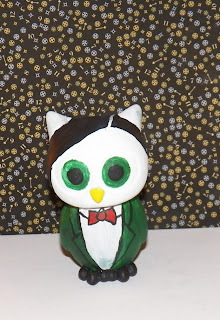 This is the TG painted, a little 11th Doctor Owl. The background is my test print of a ditsy design for an upcoming Spoonflower contest. Just had to show it off. She'll post it to her Cut Out and Keep account later too. SUPER cute! I love everything down to his attire! I told her you said so, and she said "Thank you very much!" Hoping Michaels gets in some more before Halloween. They are too cute.